yet another great post! makes me want to take a stroll through it asap. I love this cemetery. I don't know the "type" of that gun, but it's naval and associated with the Spanish-American War. There's one over at the old State Capital in Raleigh, too. Julian Carr served a term as "commander" of the United Confederate Veterans, a post-war veterans organization, a position which carried the honorary title "General". I HATE TO OPEN OLD WOUNDS BUT WHAT EVER HAPPED TO THOSE POOR PEOPLE'S BODIES that was on the lot on Watts St (where they were moving the Sweeney House). you know the one where they took the back hoe and basically descritated the bodies? You know the one where the guys wife brought the lot then he brought it from her to raise the value for appraisal purposes but the lot was only valued $100 by the tax dept. How many bodies did they wind up diggin up anyway??? Did they ever get moved in the proper fashion. I have checked but I have not found a follow up. Gary? 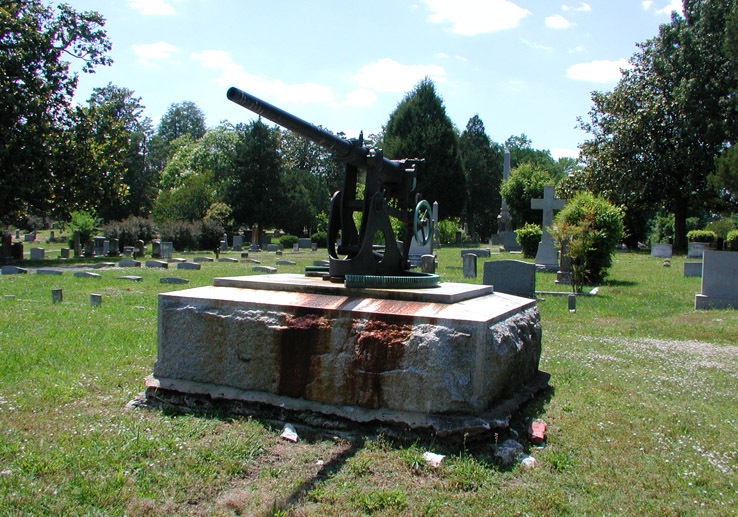 Interesting - the gun was definitely next to a group of CSA graves - the gun itself appeared to be unmarked. I'm sorry, but I don't know the outcome. I'd have to assume that it's unlikely that anyone ever came forward for those remains. I'm not sure if they were then allowed to cremate them or some other method of eliminating them. The parcel is now developed into a rather humongous house - one could only hope that it's haunted. I wonder if the new owners even know about it. A hunting... that would be what I call unequal justice. Justice but to the innocent victims...unless of course they knew about it. My comments about the cemetary... What a beautiful place. Some of the names sound familiar but because of not being a native of NC I am not familiar with the names, except Richard Wright whom I assume is the author/playwright. I wish cemetaries would also list some sort of clue as to who the person was. Being from Durham, I'm quite familiar with the names. I've never been to the cemetery, but will make a trip to it the next time I'm in town. The pictures slightly remind me of Oakland Cemetery, here in Atlanta. It's rather historical, as well. TSQ75, I saw this activity in late September. The "moving to 2000 Chapel Hill Boulevard" sign gave me pause, considering that's the address for the Lakewood Shopping Plaza. But, after looking up the church's website, it appears that this is not a full demolition, but rather an expansion of the church footprint (see artist's rendering here). The church is First Calvary Baptist, by the way. Amazing what this blog makes you take notice of, isnt it? Er, my mistake. After driving past it this Saturday (18 October 2008), it is clear that the entire church structure is being removed. Right now it's a big, crumbly pit. What a shock! 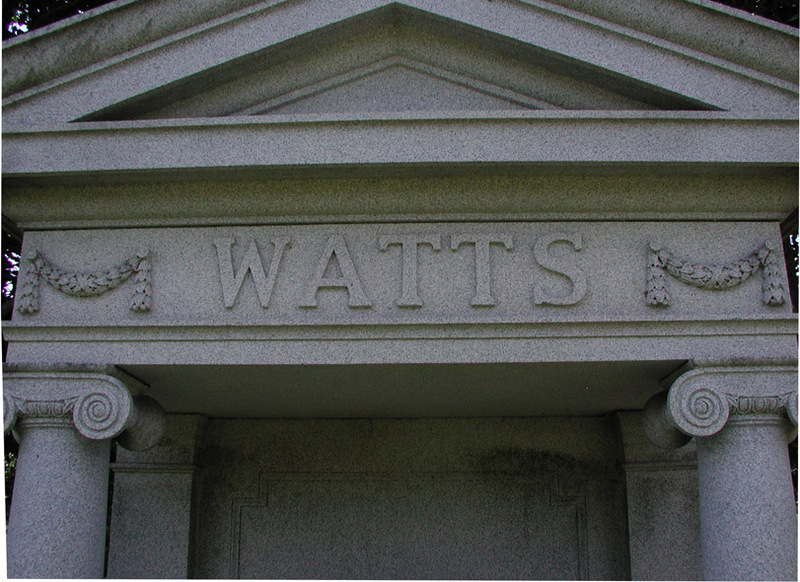 I am commenting concerning a cemetery (or at least a number of headstones) that were on Watts Street in the block between Markham and Green Streets and across from the Church of Latter Day Saints and Beth El Synagogue. I grew up on Watts Street during the 50's and used to walk from my home to "Mr. Welch's Grocery". On the way, I passed the empty property which was beside the brick house on the corner of Markham and Watts. I remember one headstone which was a yellow-colored stone and bore the name HIAWATHA. Back in l998, I visited my aunt in Key Biscayne, FLA. She also grew up on Watts Street. I asked her if she remembered that cemetery and she said she did. Does anyone else remember that cemetery? Does anyone know what has happened to those headstones and graves. I live in Salisbury now and rarely get to Durham. SnarkZone's Mom, Scroll down on the left side of screen and click on Watts Street link, you'll find more recent info there on what's become of that family cemetery. It's sad. Be SURE to click on the link listed in Gary's "Tour de force" story, it is quite a tale. Maybe your memories can fill in some blanks; there are questions about whether there was once a fence around the graves, and exactly where the boundaries to the cemetery might have lain. All somewhat moot now, since it's underneath a McMansion. Like you, I watch what happens to Durham from afar, but it doesn't make it any less painful. The newer part of Maplewood Cemetery was my playground as a child. I learned to ride a bicycle there, ran races with my cousins, went for rides in my uncle's goat cart. When I come back to Durham for visits, I always go there and revisit my favorite spots. Everything else in Durham has changed so radically, but the sections of the cemetery that were developed when I was a child are exactly the same as they were then. Being there is like going back in time. It's one of my favorite places in the world. 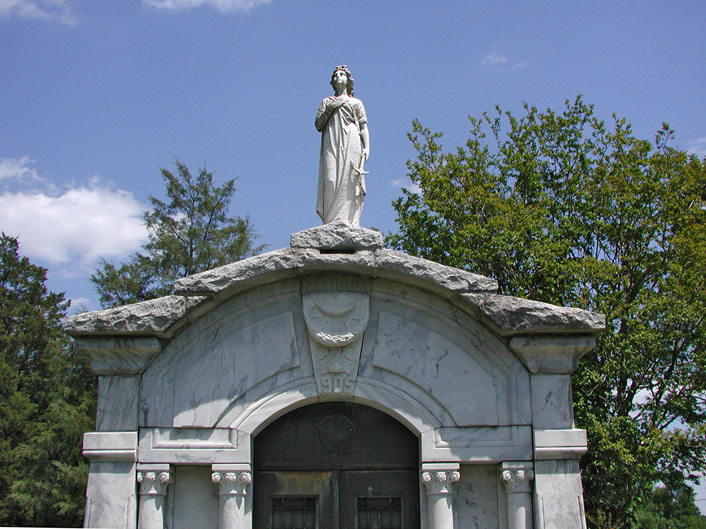 The Statuary of the Mother and her two sons are a part of the Julian S. Carr site. Julian S. Carr had an Italian sculptor do those for his wife when she died. My grand-aunt Laura Noell Carr Chapman was married to Austin Carr, J.S.Carr's son. I remember earning money in the summer for a couple of years...per the request of my aunt to clean the statuaries at that site. I guess it was my dad's way of keeping me busy. He would drop me off in the morning with a bucket and a brush...and check on me every couple of hours to see how I was progressing. There are at least 3 beautiful statuary. I would really like to find this site since I have many relatives burried in Maplewood. Anon - they must have changed the link and broken mine; I've fixed it. If you or anyone has further problems, you can go to cemeterycensus.com and navigate through north carolina, durham, to maplewood. Almost my whole family is buried there. Nice cemetery, especially the old section which has all the beautiful architectural buildings and memorials and lovely trees/bushes/flowers. The new section only allows headstones and no trees/bushes. All the 'well-to-do' were buried here years ago. It's not is a very safe neighborhood, anymore, but it's gated and still looks well maintained. Does anyone know if a Miles Sampson Draughon is buried there?Are any information on him. In the late 1960s as a teenager I would walk through here late at night. It was sort of odd. But as they say, the one's outside don't want to get in and the one's inside can't get out. Could you please elaborate? Richard Wright? Source? 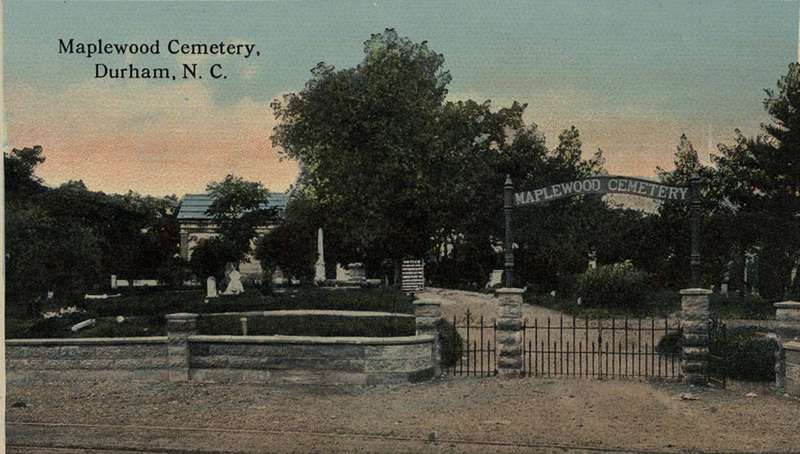 Maplewood Cemetery was established in 1872 by the purchase of an empty field of land to the west of the city limits. William H. Willard was paid $1500 for the land. Prior to establishment of the cemetery, people had been buried in the churchyards of their particular church. Some were exhumed from the churchyards and reburied in the cemetery. 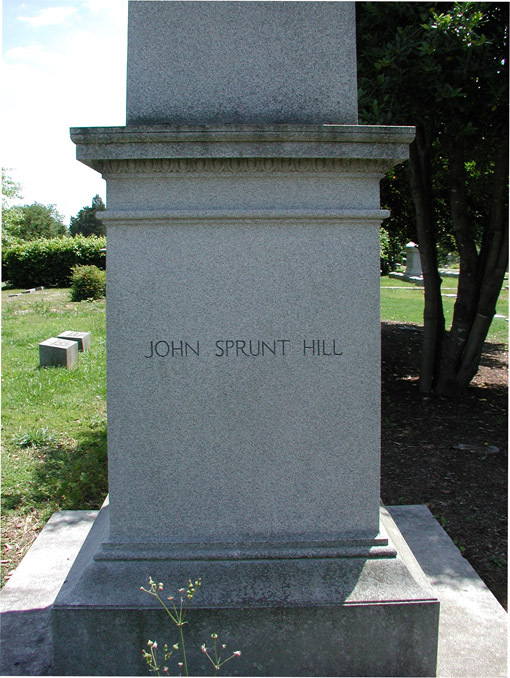 The cemetery was established at what is now Kent St. and Morehead Ave. - essentially, at the time, a ways out of town on the road to Chapel Hill. While some minimal development already existed in the West End, the town grew around the cemetery. The cemetery was located on high ground, and while the high ground developed early, the ravines to the south and east developed more slowly. The city at some point established a separate, adjacent cemetery for Jewish burials. Allen Dew's excellent cemetery census reference site has a seemingly comprehensive list, and notes 22,000 burials in Maplewood. The cemetery is surprisingly large - 120 acres in the middle of the city. The old part of the cemetery today is a peaceful and, to my mind, beautiful and strangely under appreciated place. While due to demolition, there are few extant houses associated with the people whose names appear repeatedly in any study of Durham history, the old part of the cemetery is a veritable Who's Who of movers and shakers in Durham's past. Amongst big oaks, magnolias, and cedars are monuments large and small - statuary, crypts, even big guns. (G. Kueber) At the southeastern corner of Maplewood is the Durham Hebrew Cemetery, with an entrance off of Morehead. The very detailed site devoted to mapping and sharing stories about those buried there is worth a visit. In a bit of dark humor, Wyatt Dixon related the story in a few of his Morning Herald newspaper columns that the first man to be buried in the cemetery opposed its purchase. Louis Austin - who evidently held some role in the city that gave him a voice in this decision - opined that the city needed a baseball field far more than it did a cemetery. He was overruled. Soon afterward, though, he participated in a celebration of a Democratic victory (Carr over Duke for ? State Senator) by repeatedly firing a cannon that was located at the Old Bull Factory. The cannon exploded, killing Austin, and removing limbs from his fellow celebrants. He is therefore buried at grave #1. I'm not sure why more people don't seem to venture into Maplewood - maybe not everyone finds cemeteries to be beautiful places. But I highly recommend a walk-through on a pretty day. Aerial of Maplewood - the older section is outlined in red, the newer, more car-centric and minimally treed portion is outlined in yellow.